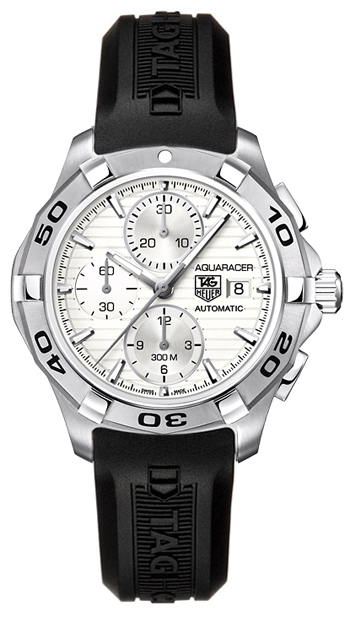 The Tag Heuer Aquaracer family has a new member who loves to swim. If you love water sports but also want a stylish luxury watch, the CAP2111.FT6028 with water resistant case and movement is made for you. All this functionality would be argument enough for considering this watch as your next favored timepiece, but the CAP2111.FT6028 Aquaracer isn’t just a swimmer’s dream. It is good-looking, too. Design details such as the Tag Heuer emblems on the case and strap, and the subtle horizontal silver striping on the dial make this watch stylish enough for any post-swim social event you care to attend. A similar watch with identical case and steel bracelet is the CAP2111.BA0833 model. Pros: Rugged materials and quality craftmanship means this watch will be a dependable piece of safety equipment for your next water expedition. Stylish lines and features help pack all of that functionality into an attractive package that you can wear anywhere. You’ll never have to change watches, and you’ll never have to wind this one or worry that the battery may fail since the automatic movement keeps the watch accurate for up to 42 hours even if you don’t wear it. For a price tag of $1942-$2700 depending on your choice of retailer, this is a luxury sport watch that is not too far out of reach. Cons: There are cheap imitations of this watch that you must be wary of. My guess is they do not meet the same quality standards, particularly in regards to water resistance. There is also a small price to pay in terms of maintaining the quality of the water seals. Tag Heuer recommends having this watch serviced on an annual basis to be sure the water seals are still effective. 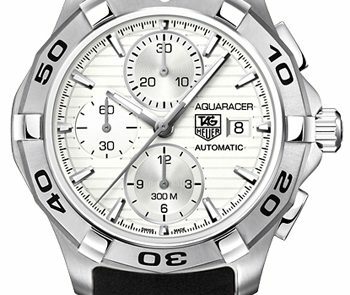 If you’re looking for a watch that can go straight from the pool to the party, this version of Aquaracer is ready for you.